Dogs love stuffed Kong toys, and the holiday season is the perfect chance to try out some new, dog-friendly holiday recipes for your furry friend. Kong toys should be stuffed all the way through. For a holiday treat or meal, just slipping in some peanut butter and a little treat doesn’t cut it. Especially when all the humans are eating delicious holiday treats. This does not mean you can use all human holiday food in a Kong toy, because some holiday foods are poisonous to dogs. Stick to the pet-friendly recipes below and your dog will be safe and happy. A Kong toy is like a meal without the bowl. 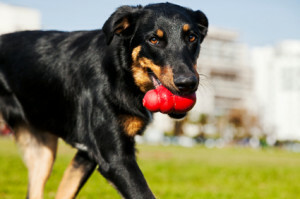 You can feed your dog his whole meal inside a Kong, which encourages his natural longing to work and forage for food. He’ll have to work a bit to unpack your Kong toy. This keeps him from wolfing his food, too. Here are some holiday Kong recipes to try. Combine ¼ cup dry kibble, ½ cup canned dog food turkey stew and 1-2 pieces of Fruitables cranberry and pumpkin treat. Mix all ingredients together. Fill the Kong, serve or freeze. Combine leftover mashed potatoes with a little kibble and a few choice pieces of lean turkey. Fill the Kong, serve or freeze. Combine canned pumpkin (not pumpkin pie filling), smidge of cinnamon, small apple chunks and a little kibble. Fill the Kong, serve or freeze. Remember it’s always good to block the small hole at the narrow end of the Kong with peanut butter, cream cheese or canned cheese or a treat. You can mix these lovely recipes in Ziploc type sandwich and gallon bags, cut a whole in the bottom corner and ‘pipe in’ the goodies into the Kong. No fuss, No muss. You can freeze the recipes in the bags, defrost them and then pipe them in as needed. Always watch your dog while he eats from his Kong dog toy. Always watch your dog while he eats from his Kong dog toy. If you bring your pet to a Richmond dog boarding facility during the holidays, make some extra Kong toy meals or treats and let the staff know that he has them. For more Kong recipe fun, make sure you check out their official Kong stuffing guide.